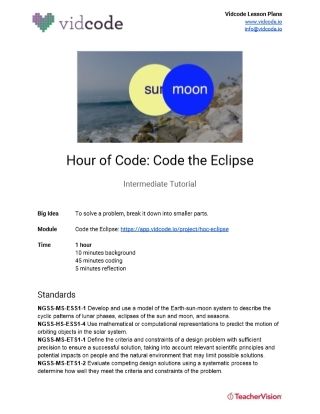 Students will learn and practice 21st Century skills like problem-solving, creativity, data synthesis, and initiative while they code a simulation of a solar eclipse using this lesson plan from Vidcode. Perfect for an Hour of Code session or time block, this lesson plan includes a 45-minute coding challenge, a 5-minute reflective practice component (written or sharing), and a number of extension activities that can be used to extend the scope of the challenge over several class periods, if desired. Vidcode is an award-winning coding platform and curriculum built around the things students love to do! Vidcode provides an complete computer programming curriculum for 3rd to 12th grade, focused on creative coding, design thinking, and practical cross-disciplinary applications. Bite-sized tutorials are easy for non-technical teachers to implement, fun for students to code, and data-driven for analysis of student outcomes. Whatever students love, Vidcode can help them code it!